At M & M Auto Detailing LLC, we know that buying and maintaining your car are huge investments. We also understand that you would only want to leave your car in experienced hands when you are looking for repair and auto detailing services. 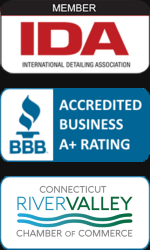 Our mission remains to provide you with the best quality services in South Windsor, CT.
From our humble beginnings in Mike Fuda’s parents’ garage in 1996, we have grown a business and built a brand that takes pride in the superior services and personalized customer experience we offer. Today, we are located in Glastonbury, CT, and continue to offer customers in South Windsor the best auto detailing services. All our services are designed to give you the best in auto detailing services. We cover every aspect of both the exterior and interior of your car. We get to every stain, dirt, scratch and other imperfections that undermine the aesthetic appearance of your car. We know what is required to restore the appearance of your vehicle and give it the showroom-sleek appearance. You can rely on us for all your auto detailing needs in South Windsor, CT.
Our car detailing shop not only has qualified technicians but also years of experience to cater to a variety of customer needs. Whether you are looking for Express Detailing and Hand Washing or want the interior of your vehicle reconditioned, look no further than our South Windsor car detailing shop. > We have a window tint expert who will use top performance films to ensure that you get first class installation and fully customized services. > Our experts in interior detailing will ensure that they get to every dirt, grime, and stain. This will ensure that even the hard to reach areas of the car are left spotlessly clean. > To remove all scratches, contaminations, imperfections and paint defects from your car, our exterior detailers use the best technologies in wet sanding, buffing and vehicle prep. > Our express detailers promise to deliver a showroom-clean look whenever you bring your vehicle in for maintenance in between services. With our expertise and years of experience, we have become the best at what we do. Visit our car detailing shop in South Windsor for the best services. We are a fully licensed and accredited auto detailing business. With our years of experience in the industry, we stand by the quality of our work and promise you complete satisfaction.